In 1385 London, the race is on to recover a missing book. Outside the walls of London, Agnes, a “maudlyn,” or prostitute, observes the murder, by a cloaked, Italian-speaking thug, of a young woman, whose dress and accent bespeak noble birth. Agnes leaves the scene with a hidden prize: a book wrapped in a delicate tapestry. Meanwhile, John Gower, the 14th-century equivalent of a grizzled detective, has gotten wind of a conspiracy against the reigning king, Richard II, son of Edward the Black Prince and nephew of John of Gaunt, Duke of Lancaster. The plot may have been fomented by the followers of the recently executed heretic Wycliffe, who are using the prophecies of one Lollius, an ancient Roman, as a blueprint. Lollius, it seems, predicted the manner of death of each English sovereign since William the Conqueror, and there is one prediction yet to be fulfilled: that on St. Dunstan’s Day, near a bishop’s palace, butchers—abetted by a Long Castle (Lancaster)—will lie in wait to slay the current monarch. As it happens, these prophecies are contained in Agnes’ contraband volume, which has fallen into the hands of her sister Millicent, who hopes to sell it to restore herself to the middle-class existence she once attained as a knight’s mistress. 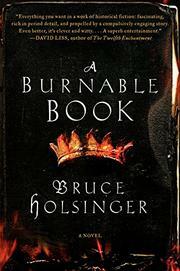 Trouble is, possession of a “burnable book,” one that embodies heresy and/or threats to the king’s person, is high treason. Gower and his friend Geoffrey Chaucer are hot on the tome’s trail when Gower’s sinister son, Simon, returns inopportunely from exile abroad. Enter Agnes’ best friend Eleanor/Edgar, a transvestite, whose main goal is to free his brother Gerald, a butcher’s apprentice, from the clutches of his cruel master, Grimes. Gerald has overheard Grimes planning just the sort of butchery envisioned by the book. Although the burgeoning web of plots and plotlines is dauntingly complex, the determined reader will be rewarded with a fascinating overview of pre-Renaissance London at its best and worst. A highly literate thriller from medievalist Holsinger.